It’s easy to see the beauty of the sunflower when you look at it, but some of what makes the flower special remains a mystery to many people. For instance, do you know tall a sunflower can grow or all the ways in which a sunflower can provide for a human? If you do, keep reading because we’re going to give you a more sunflower trivia that might surprise (and delight) you. If you don’t, read on as well, and find the answers to these questions, and others, as you learn about the beautiful sunflower. The sunflower is a type of flower called an inflorence, which means that it’s actually two, or more, flowers in one. The sunflower, like the daisy, has central florets and an outer floret, which come together to make up a seemingly single bloom. This design helps birds and insects easily see the flower, and it assists in pollination. Every floret, when pollinated, can produce a seed. 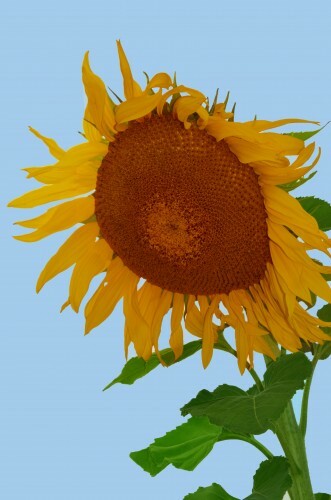 In 2012, the tallest sunflower measured was recorded in the Guinness Book of World Records. The specimen grew in Germany and reached 27 feet! The florets in the head of a sunflower form a spiral, with each small flower oriented toward the next by an angle of 137.5 degrees (called the golden angle). This orientation forms a pattern of spirals that interconnect, with the number of right and left spirals being consecutive Fibonacci numbers. Typically, a sunflower has 34 spirals in one direction and 55 in the other. If the sunflower is large, it might have 89 spirals in one direction and 144 in the other. If you like to snack on sunflower seeds, you’re probably eating striped seeds. Use sunflower oil in cooking? It almost always comes from black seeds. The sunflower is native to the Americas. Early Native American Indians used its seeds to make body paint, dye, food like oil and bread, and healing ointments. In addition to peanut and almond butter, sunflower butter tastes amazing on sandwiches, crackers, and fruit. Sunflower butter is made from sunflower seeds, and it’s especially popular in Germany where it’s mixed with rye flour to spread on bread. The sunflower serves many useful purposes, in addition to those we’ve mentioned and looking gorgeous. It’s a popular muse for artists (Van Gogh’s Sunflowers is one of our favorite paintings) and it can be used to extract toxins like arsenic and lead from soil. Do you grow sunflowers in your garden? Do you often keep them in your home? If so, let us know what you find special about the sunflower by leaving us a note in the comments below.